So, I've been a little ranty-pants for the last few days. I hope y'all can forgive me. I was under the weather with the blergs, but I feel a lot better now. My posts from now on will hopefully reflect the improvement! And now, while I wait for my CP's to finish writing their current wip's, or to finish their revisions, I shall return to the writing trenches. It's George! Hows about we go for a ride? It has been so long since I worked on book three in the series I'm querying right now that I have absolutely no recollection of the details I've written so far. I remember the basic story up to the point where I left off, but revising two of my own books, plus doing critiques and beta reads on several others, not to mention all the summer vacation business, I'm afraid I drove all the plot details right out of my little pea-brain. I know the worst thing you can do is go back and edit before the first draft is complete. I'm trying to promise myself to leave all the words alone, but I must go back and reread from the beginning. I don't remember some of the minor characters' names (folks who are necessary to the plot, but with very little time on the page so far), all the little twisty-turns I've written, and exactly that the timeline looks like. I MUST go back and read it from the beginning. I hope I don't fall into the trap of revising the first draft in progress. Then again, I revised books 1 and 2 so much in the last few months, some revision will probably be necessary. Required, even. Otherwise, what I've already written won't make sense with the other revisions... Sigh. So there it is. The main reason I've been procrastinating on getting back to writing. Editorial Paralysis. I'm looking to George for support. Come on, George! Has summer derailed your writing plans? Or have you ever walked away from a half-written manuscript, only to return several months later? How did you get back into it? I'm trying to get into writing at all right now. I pound on the keys here and there, but I feel so meh. Glad to see you better! Good luck to you on getting back on your own horse! Yes and yes. I find it impossible to write in Summer when my friends are constantly posting beach invites on Facebook. Or day trips to Sydney. Or a trip up to the Vally. BUT YOU HAVE GEORGE! How do you write, ever? For the sake of clarity, George is not my horse. 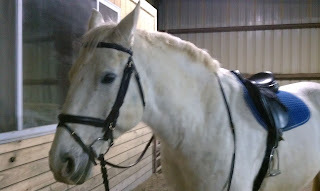 I got to ride him once. He belongs to a friend of a friend, and he doesn't like me. He's used to English tack, and I ride western. I confuse the hell out of poor old George. Thanks for this post! Makes me feel better about writing book 2 of the series I'm querying (screaming to get on the page, and I'm already 200 pages in). Right now, Book 2 is coming much better than the first book of another series I'm writing (first-draft done, but I have to arrange all the puzzle pieces, change tenses, POVs, and it's fighting me every step of the way--I'm only 35 pages in). And don't worry about revisions on the first draft--it just means you'll have a better first draft when you're done.